As the number of rhinos killed by poachers keep rising and more traumatized orphaned calves are in need of care, Kirsten Everett, a volunteer at Nikela, takes us on a touching journey as she looks at the horrors of a poacher attack though the eyes of a young Rhino calf. “My mother and I were contently filling our hungry stomachs when we heard a strange noise. I carried on eating but she smelt the air for unknown scents. I saw the terrified look in her eye before she managed to control it; the unnatural smell meant something. A few minutes later we heard the ‘whop, whop’ of a metal monster flying closer towards us. Just when my mother focussed on it the men crept out of the bushes with a crunch of sticks. Something seemed to hit her and she grunted in surprise. The birds abandoned their posts heading away from the danger. I stood helplessly as she tried to run but ended up falling to the ground. The men surrounded her and tried to chase me away. I ran forward scared enough to not care about the men as they had done something to my mother, I needed her and they must go away. Out of nowhere one of the big men spun on me and hit me hard with something sharp. Blood oozed from my wound as my mother answered my cry for help with a weak beg, ‘Away, away’. I backed away nursing my wound, how could I get to her?? She grunted again so I didn’t give up. I ran forward again but this time the angry man was merciless, determined to get his message across. As quietly as possible I took the cuts to my poor head trying not to worry my mother even more. Confused I backed away into the bushes calling to her to get up, but the eerie silence dragged on and she didn’t move a muscle. Fear glued me to the floor as I felt my young heart pulsing with anger and fear. A breeze blew, as I waited for the monsters to go so I could go to my poor mommy and find out what was wrong. My heart skipped a beat when I realised this was what my cousin had gone through only a full moon ago. It was terrible, my body couldn’t stop shaking and I couldn’t think clearly, I felt lightheaded from all my blood loss. Finally when the monsters left I ran to her side, ‘Mom wake up.’ My voice cracked with emotion but still she didn’t respond. I took a step back and saw the pool of blood. 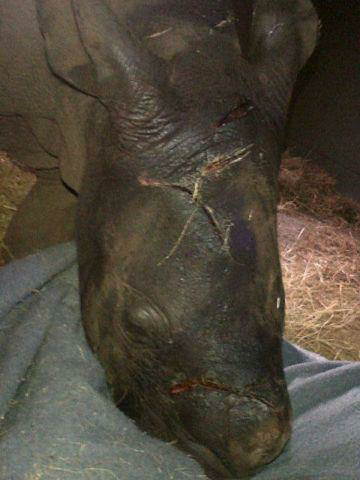 Her horn had been brutally cut off and she lay lifeless. Above me a crow flew over. I turned to run then I asked myself some important questions… where would I go? I wasn’t old enough to know the way to the dam yet. Who would protect me from predators? The truth was that I wasn’t strong enough to survive by myself yet. Would I be with my mother in the sky sooner than I thought? The last question scared me the most; out in the wild without my mother I might just be able to survive a week. I heard the snap of a twig, I wasn’t alone. This time I didn’t have the strength to care what these humans wanted with me. I collapsed and slept for a few hours. I was almost completely unconscious though I sensed kindness near me. Too traumatised to do anything I lay as they treated my wounds. The people who tried to comfort me planted a seed of hope. Hope that I could survive and hope that the rest of the human race would come to its senses and help my species and all the others out there”. Let’s stop the babies’ cries! Let’s save the last rhin0! Written by Kirsten Everett. Based loosely on the story of “Ntombi” who was rescued by Karen Trendler and her team.